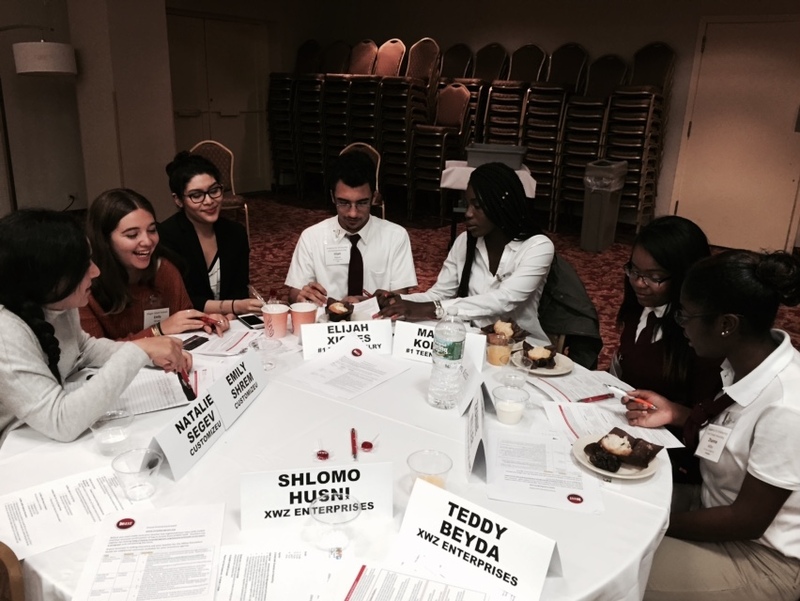 On Tuesday, October 13th, 40 VEI student executives representing different firms from the five boroughs of New York City attended the 2015 Fall Executive Conference hosted by ACORD/InVest/St. John’s University. The event enabled VEI NYC students to learn about the importance of insurance and the role of a Chief Risk Officer, discover insurance career paths, and network with their peers. Opening remarks were delivered by Soteria Stavroulakis, VEI New York City Program Coordinator and Beth Grossman from ACORD. Following the opening remarks, a panel of guest speakers; Ira Cohen, risk manager of TIAA-CREF, Tom Vouvoudakis, Production Underwriter at Scottish-American, and Tom Nowak of AIG all discussed their respective roles in the insurance industry. In addition, Diane Mattis from InVest, an educational insurance organization, spoke about how InVest provides insurance instruction, improves student insurance literacy, and introduces career opportunities. Following Diane Mattis was Beth Grossman of ACORD, who discussed the standardized forms that are commonly used in the insurance industry along with John Anderson of IBM who explained the use of data and analytics in order to properly evaluate risks. Finally, Jody Queen Hubert of St. John’s University, and Thi Nguyen, a student at St. John’s spoke of the Insurance and Risk Management program that the university offers. The day concluded with a panel of VEI NYC alumni, all former VEI CEOs themselves, who shared tips and advice with the current student executives as they prepare for the next phase of their careers. Panelists shared their personal experiences, their professional growth, and specific techniques for leveraging the VEI experience after high school. At the end of the insightful day, VEI NYC executives were given the chance to engage in a reflective discussion about the expectations and challenges of a CEO in order to lead their firm to success.